This is the first in a series of posts where we reflect on our past projects and workshops. We hope our personal insights and takeaways help you towards achieving your mission. We partnered up with an information technology company and were asked to conduct a workshop for the faculty of a business school. 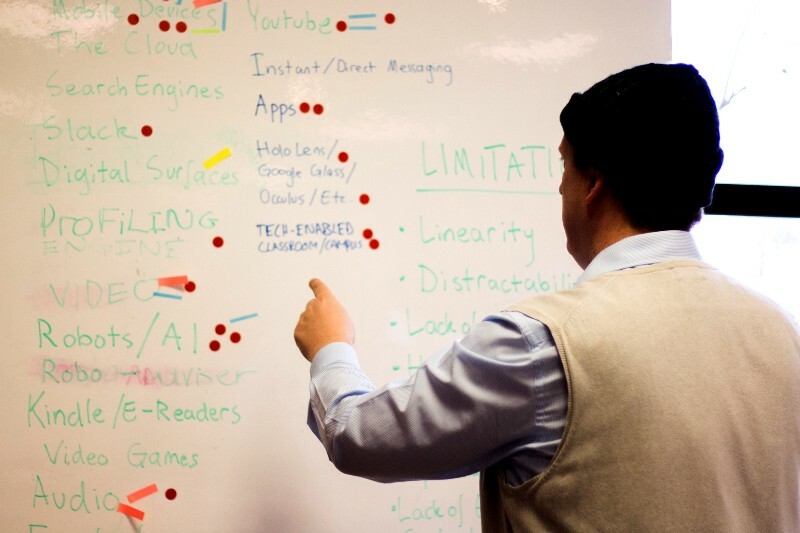 Their goal was to come up with actionable ideas related to the intersection of technology and teaching in order to quickly develop and implement their own technology-enabled learning. We were tasked with facilitating the brainstorming and ideation phase of the workshop. From both personal experience and the great variety of things written about brainstorming, we’ve long been aware that it’s a hard and often intimidating process. Not only do people often feel vulnerable trying to explain their ideas, but it’s frustrating when someone leading a workshop asks you to please-be-super-creative-right-now-thanks. We believe that brainstorming and ideation is easier, more enjoyable, and more productive when done in a small group with a set of guiding constraints. Our first step was to set up a Slack group for workshop participants, where we gave them three short research challenges to get them ready for the brainstorm. As a constraint for the workshop itself we created a Brainstorm Booklet for each participant. These included: an introduction to brainstorming, slots for the three brainstorming constraints, a stand-out ideas area, and a future steps guide. Prior to handing out the booklets we had a group discussion to set up the context for our brainstorm. 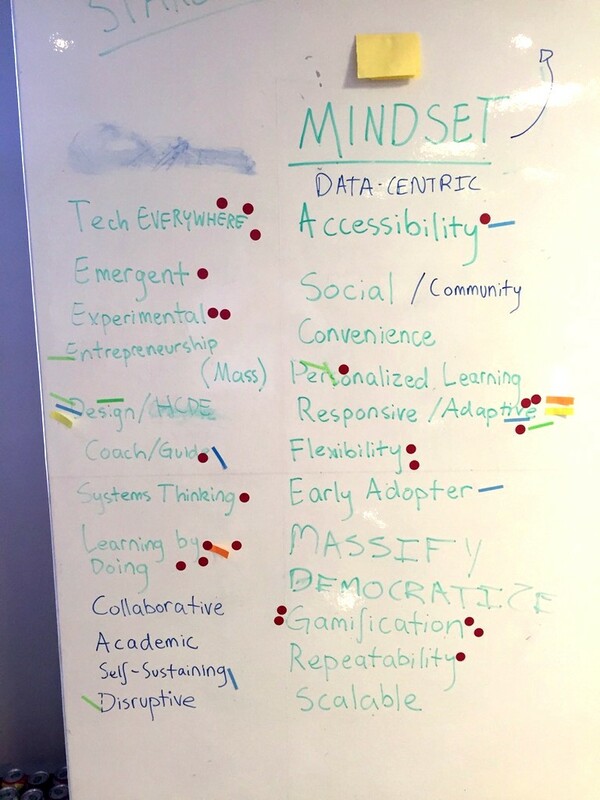 During this discussion two of us from IQ documented the themes that were brought up into the categories of Mindset, Approach, and Technology. 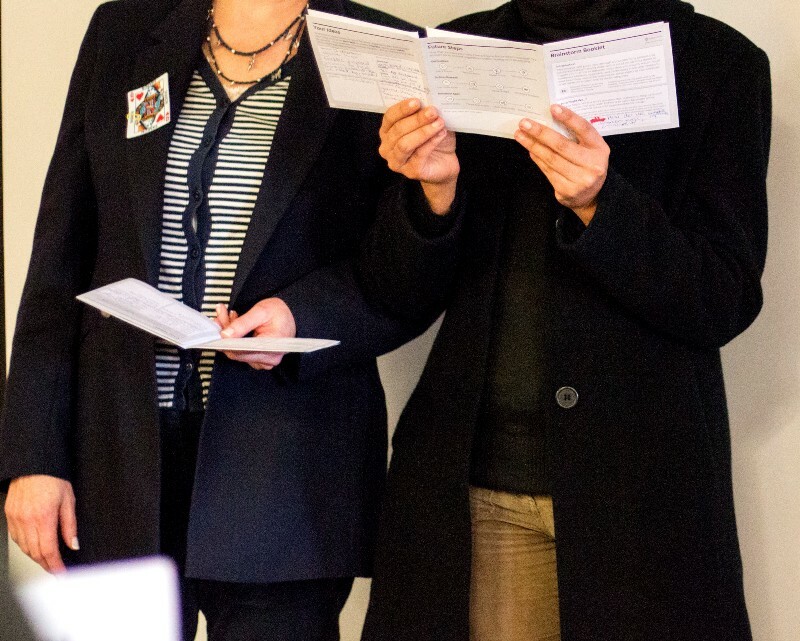 We then asked people to vote on the ones that stood out to them. From these top picks, each small group was randomly assigned a Mindset, Approach, and Technology to frame their brainstorm. 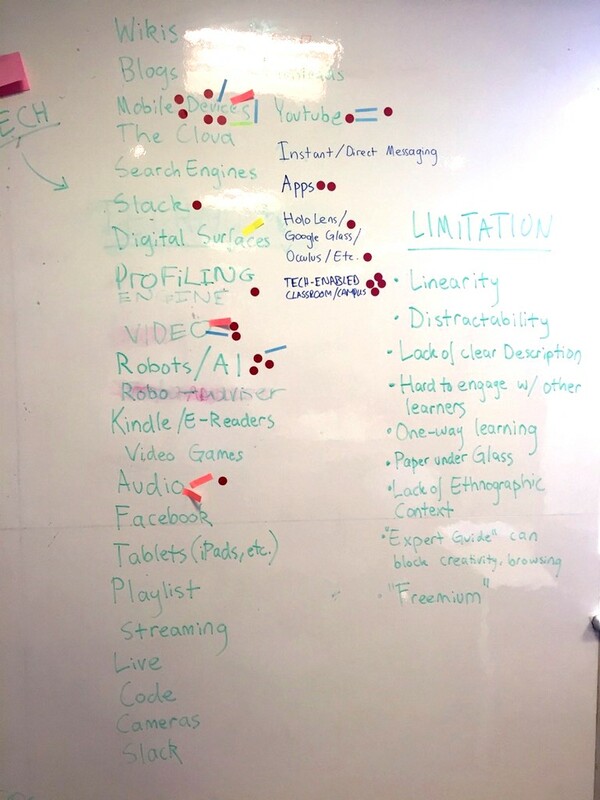 Using some element of these three constraints, participants were asked to brainstorm as individuals and then to flesh out their ideas in their small groups. The teams were then asked to pick their favorite idea and present them back to the larger group, who gave input and feedback. 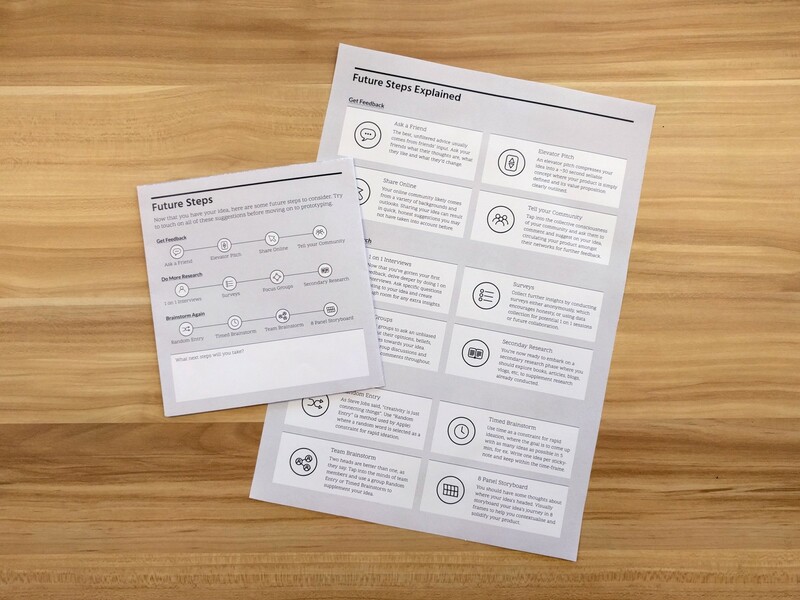 The final section of the booklet, future steps, acted as suggestions for what the teams could do next to carry their ideas to fruition. 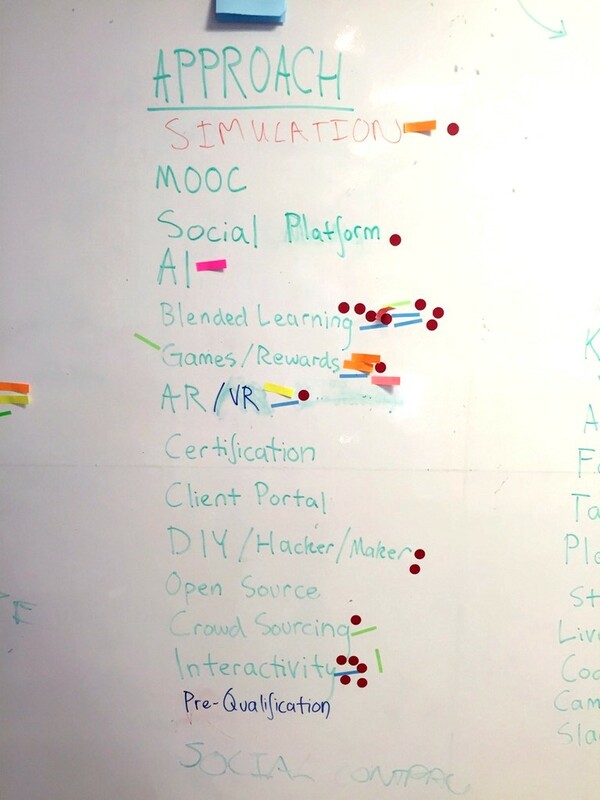 We didn’t want these ideas to get lost after the brainstorm, so we provided an open framework for things people could feasibly do in the very near future to further develop their ideas. 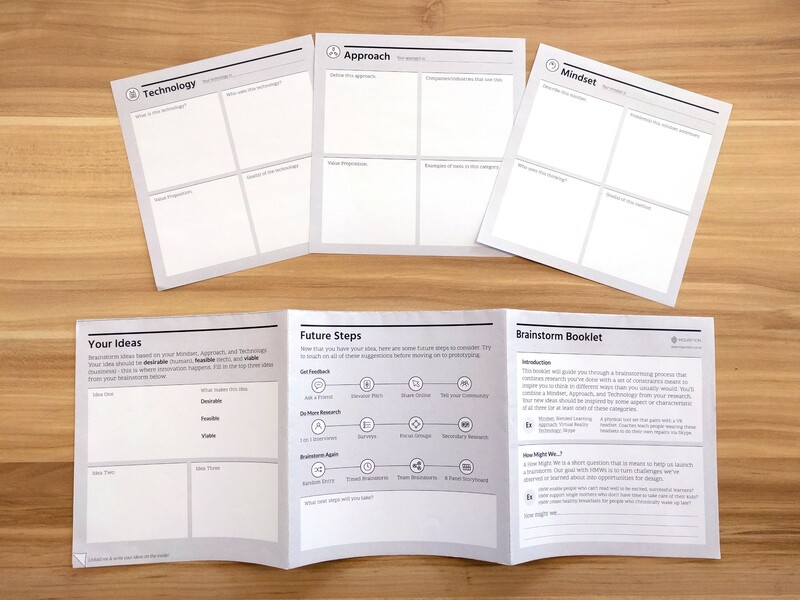 We also created the Brainstorm Booklets as self-contained units that all participants could take with them. Take time to set the brainstorm up properly. Without a “warmed-up” mind and a good understanding of what the process will be, people can become confused or disengaged. 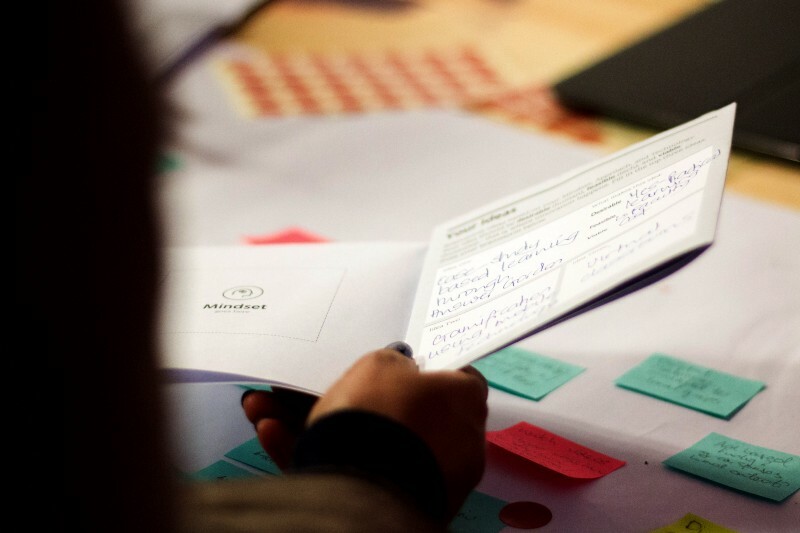 Giving people a tool or guide to support ideation sparks dialogue. We heard a lot of exciting ideas and viewpoints being pulled out of the Brainstorm Booklets. Time constraints make a brainstorm difficult, no matter how much you prepare. Some people still felt pressured to come up with good ideas quickly and seemed more hesitant than others. Presenting ideas back to the group is a rewarding experience. Our small group presentations sparked some great discussion between people who otherwise might not interact much. The brainstorm isn’t the end. Brainstorm participants might have a great idea related to the session days or weeks afterwards. Ensure that there’s some way of collecting and diving into these insights even after the brainstorm workshop is over. Set ground rules for the day. Brainstorms often happen with co-workers of different ranks and positions. To encourage everyone to speak, listen, and participate equally it’s good to set some expectations and guiding rules at the beginning. Ensure that the context is clear. Knowing why they’re brainstorming and what the end goal is helps people get in the right mindset. Make your brainstorms fun. Finding new ideas shouldn’t feel stuffy or forced — giving people room to explore will lead to more innovative ideas. Don’t put all your eggs in one basket. Don’t expect this brainstorm to solve everything — people won’t just suddenly have creative ideas because you tell them to. Creativity is a mindset that needs to be learned and practiced. People need to feel safe. Give people something to support their brainstorming (a guide or tool, a new brainstorming method, etc) and emphasize that all ideas, even (especially) very silly ideas are welcome. Provide support from a strong facilitator. People will have questions and want support during a brainstorm — ensure that you have someone present who’ll help things run smoothly. Interaction Designer at Al Jazeera Media Network. DE — USA — SA — USA. Resources, retrospectives and ideas from the Inquisition team.